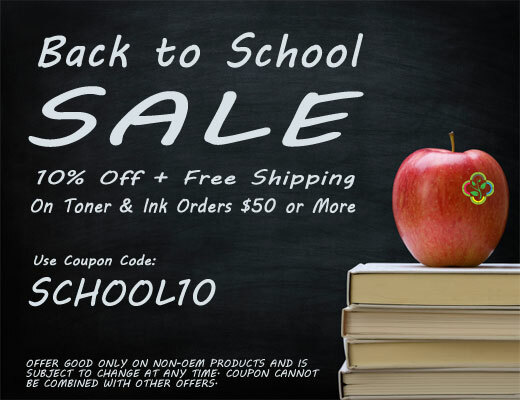 Back to School Sale - Save 10% on Orders $50 or More | TonerGreen - Eco-Friendly Toners from the U.S.
Get ready for school, the eco-friendly way! 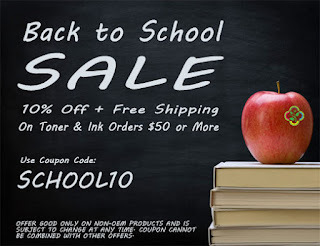 Buy our remanufactured ink & toner cartridges now and Save 10% on Orders $50 or more by typing in the coupon code SCHOOL10 at the coupon box located at the checkout page. Hurry up, because this sale ends on August 18. As always, orders $50 and up qualify for free shipping. So what are you waiting for? Go and get ready for school, the eco-friendly way! TonerGreen Back to School Sale is not valid on OEM products and cannot be combined with any other coupon codes. TonerGreen's primary product line includes U.S.-made remanufactured toner cartridges and remanufactured inkjet cartridges. We take pride in the superior performance of our products compared to average compatible or refurbished cartridges found all over the internet. Our products are not just ordinary recycled printer cartridges. Recycling is just a part of the extensive remanufacturing process that these remanufactured cartridges undergoes to. Quality is strictly imposed every step of the process until they are either picked up by customers or shipped to their address. Aside from that, at TonerGreen.com, printer users will definitely enjoy printing over our low-cost printer cartridges and cutbacks. We also offer the greatest discounts and deals the remanufacturing printing industry has. You can check all of these at our TonerGreen Special Offers and Coupon Page. Be sure to sign up for our mailing list and we'll send you up-to-date offers and coupons as soon as they're posted. That's why if you want to save more on your printing expenses especially this school year then why don't you try using remanufactured printer cartridges and further your savings with our TonerGreen coupons. Visit http://www.tonergreen.com for more details.